Looking for perfect Loose diamonds online ? Looking for high-quality diamonds at an affordable price? As thoroughly explained by GIA here http://www.gia.edu/diamond-quality-factor, the rarer the diamond the better it will hold its value. Since the rarest diamonds have exorbitant values, most of us will never have the opportunity to own one. However, this does not mean that we cannot find any affordable, rare in clarity, color, and cut loose diamonds that are within your particular reach. After decades of experience in the diamond industry, having seen diamond prices fluctuate during the financial crisis, we feel comfortable in offering you the possibility of owning NOT only the finest of Colors and Clarities but also the most commercial of sizes and shapes. We have selected, a comfortable premium product for you: Loose Diamonds from 0.50cts to 1.49 its, in D to I colors, and in IF to VVS 1 clarities. In order to help your search we have divided the diamonds into groups of carats 0,5 carats and up, 0,75 carats and up and 1-carat diamonds and up. This selection of loose diamonds covers both liquidity and rarity! Add to this, the possibility to have your own diamond Certified, Laser inscribed and actually sealed in an individual tamper-free blister pack by one of the Worlds most credible Diamond Laboratories. More questions about buying loose diamonds online ? 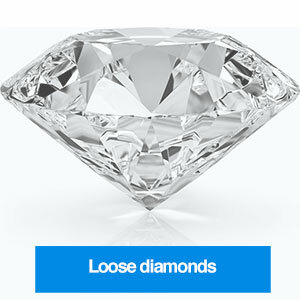 Contact our experts for free diamond advice today. Our selection of premium diamonds from 1 cts to 1.5 cts , in D to H colors, and in IF to VVS 1 clarities. Our selection of premium diamonds from 0.75 cts to 1 cts , in D to h colors, and in IF to VVS 1 clarities. QUESTIONS ABOUT YOUR DIAMOND PURCHASE?